Last year was my first time at NEAF, and I had a blast! I couldn't find a convenient place to hang my hat, however, and I wanted to get a jump on booking my stay this year. I like camping- keeps the cost down for me. Primitive is great, I'm a park Ranger: I've got the equipment and experience to be outdoors in April and be comfortable. Last year I stayed in Promised Land State Park in PA...which was beautiful and only ran me around $12 a night...but still more of a drive than I wanted to make back and forth for 2 days. I'm not asking for any closely guarded secrets, but if anyone knows of any camping areas closer to Suffern that aren't comparatively expensive, I'd appreciate your direction. Thanks very much, hope to see you there! Would love to find a place myself. I looked into this several years ago and, as I recall, all of the public facilities - e.g., state, DEC, etc. - are still closed for the season, they don't open until May. There are sections of the Appalachian Trail in the area that run through Stirling Forest and Harriman/Bear Mountain but I don't know if you want to get that primitive. ...for what it's worth -- the only two years I missed NEAF in its entire existence - were both in early April because of significant snow storms in the Catskills -- that I have to drive thru to get there. Camping in snow can be nice if it's cold enough that the snow is dry. But in early April, the snows up there are wet and heavy. 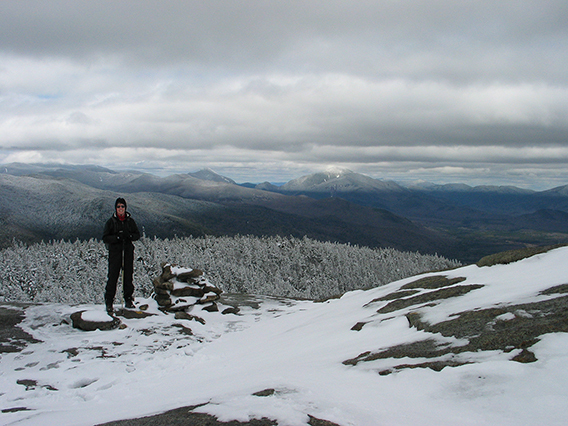 Back in '10, we went up to the Adirondaks after NEAF, stayed in Lake Placid for a few days and did some day hiking, went up Cascade Mountain, the trail started off wet but clean, by the time we got to the summit we had quite a bit of snow to contend with. But even my wife enjoyed it. Edited by DennisK, 19 January 2019 - 03:19 PM. AT...might be a fun option. It suppose it would depend a lot on how close I could get my car to a trail head. I wouldn't mind setting up at night and breaking it down mornings if it got me significantly closer to Suffern. And you can't get much cheaper than the AT! I should look into the trail traffic for thru hikers at the time. You should get an old fashioned map book of the state of New York and look up the Parks near Suffern. I happen to have one and it's indispensable. But I agree with the other posting. All the Parks are closed off for camping until May. Sorry 'bout that. Unless they've changed their policy, Black Bear is an RV ONLY campground. I looked at the place a few years ago; they even had a note posted at their website - NO TENTS ALLOWED - so that, if you brought kids or grandkids along in your motor home, you weren't allowed to set up a tent for them. Once again, this was a few years ago, maybe they've changed - but I doubt it. I called today to make sure, and can confirm that Black Bear remains RV-only. Thanks anyway for the suggestion!